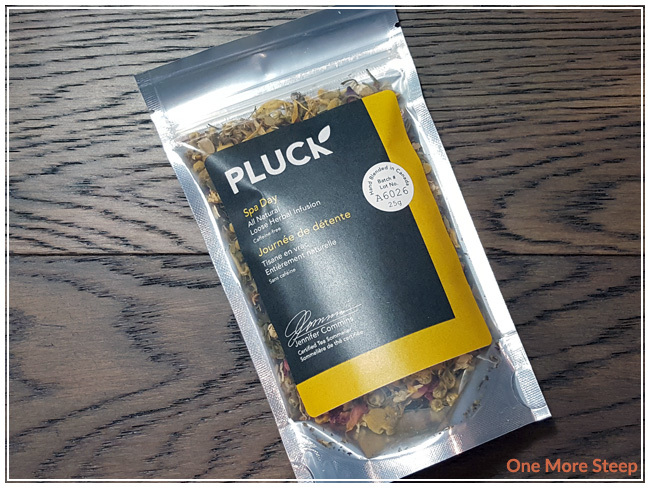 Pluck’s Spa Day came to me as part of a subscription box from The Sugared Teacup. Sometimes it’s nice to have a cuppa and unwind, and sometimes it’s also nice to have a cup of something that isn’t caffeinated before bedtime. 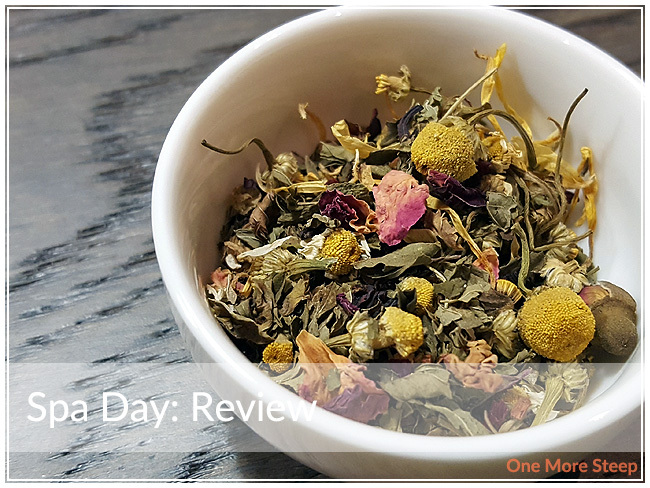 I was really excited when I found Spa Day in my subscription box from Deb at The Sugared Teacup, because I’m always looking for new herbal infusions to try out to see if they’ll fit the bill for me. Spa Day comes in a resealable bag that’s see-through on the front so you can see all the ingredients. The aroma of this blend is primarily that of mint, mint, and more mint. Spa Day consists of peppermint, spearmint, honeybush leaves, chamomile, hibiscus, calendula petals, osmanthus petals, rosebuds – all organic. It’s not surprising that the first (and last) aroma from this bag is minty. I think if I were to have been blindfolded when sniffing it, I would have thought it was a pure peppermint tisane! Pluck recommends steeping Spa Day in 100°C (212°F) water for 4 to 6 minutes. I did an initial steep of Spa Day for 5 minutes. 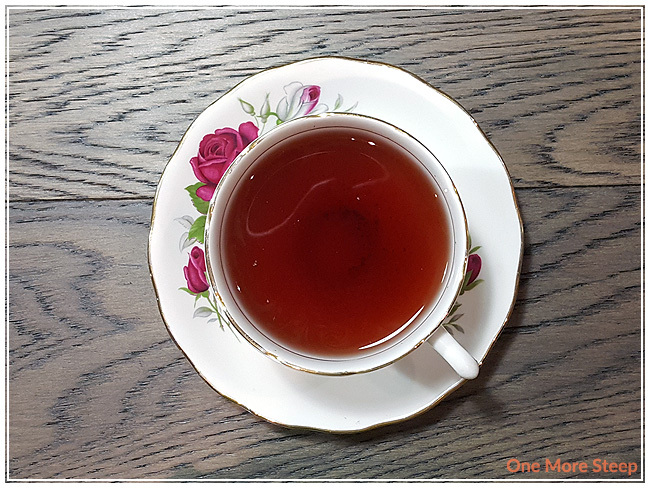 Spa Day steeps to a beautiful almost ruby-red colour – I attribute a lot of the colour to the hibiscus in the blend. The aroma of the tea is primarily that of the mints – peppermint & spearmint, which I don’t find surprisingly considering those were the overwhelming fragrances coming from the dry leaf. On first sip, I found there was a tartness that gave way to sweet very quickly. The mint leaves a refreshing cool finish to each sip. Unfortunately, I found that the floral notes that should have been present were quite lost, but I think the tartness might be from the hibiscus – and possibly the sweet flavours from the flowers. I resteeped Spa Day and found the flavours to be quite muted compared to the initial steep. I would say that Spa Day is good for just one steep. I thought that Pluck’s Spa Day was just okay. I was anticipating something a bit more floral, considering there were five different floral ingredients in this blend. 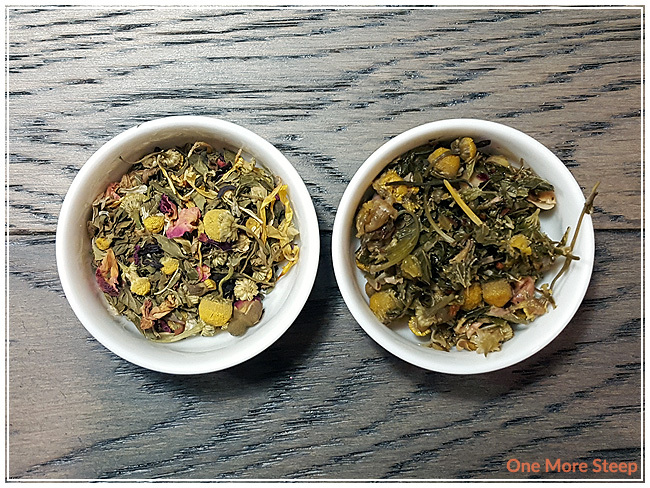 If you’re looking for a minty tea that has a touch of tart & sweet, I think this might be the blend for you! It does have some nice refreshing qualities to it, and the mint is so, so strong if you love mint flavours and enjoy a good mint tisane. 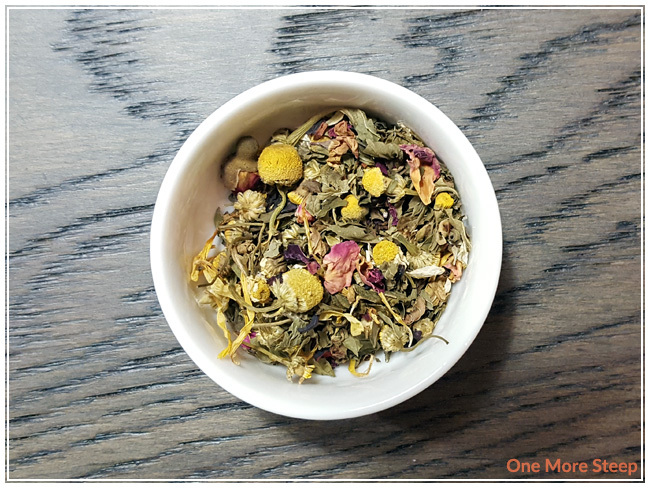 I do like the sweetness to this tisane, I just wish the flower ingredients had a stronger presence.